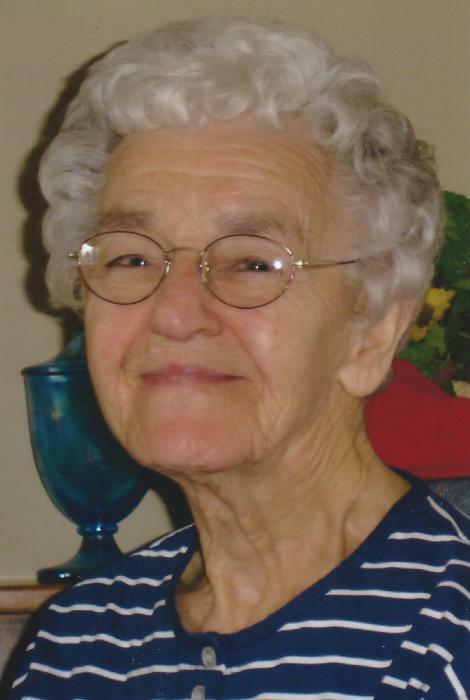 Barbara Irene Stoeberl Rockow, 93, passed away peacefully on Monday, November 12, 2018 at the Atrium Acute Post Care of Chetek. She was born on April 17, 1925 in Almena the daughter of Joseph and Emma Stoeberl. Barb graduated from Barron High School. She married Donald Rockow on July 24, 1945 and to this union five children were born. Barb worked at St. Joseph’s Hospital in Rice Lake for 13 years. When Knapp Haven Nursing Home in Chetek was built she worked there for 42 years and retired when she was 83 years old. She enjoyed her work at Knapp Haven and all her co-workers and patients over the years and always had a “pinch” for her co-workers. She moved into the Atrium apartments after her husband passed away. She enjoyed doing puzzles and crosswords puzzles and visiting with her friends at the Atrium. Barb was a member of St. Boniface Catholic Church in Chetek and played the organ for many years. Barb is survived by her children, Eric “Rick” (Betty) Rockow, Chetek, Steven (Debra) Rockow , Englewood, FL, Michael (Jeanne) Rockow, Fall Creek, WI; grandchildren: Brock (Carol) Rockow, Kane (Becki) Rockow, Derek (Catherine) Rockow, Brittany (George) Tait, 9 great grandchildren, Nick Rockow, Zander, Kolton, Grant Rockow, Carson, Everett, Justice Tait, Sarah, Eva Rockow, two sisters-in-law, Dora Rockow and Maxine Christianson, former daughter-in-law, Cindi (Jim) Bloomquist of Cedar, Minnesota, many nieces, nephews and friends. She was preceded in death by her husband Donald in 2013, her parents, her two daughters, Linda Rockow and Mary Anne Rockow, four sisters, Mary Weaver, Kate Lambrecht, Theresa Stoeberl and Leona Stoeberl, three brothers, Joseph, Alois, Ignatius “Sonny” Stoeberl. A Memorial Mass will be held at St. Boniface Catholic Church in Chetek 11:00 A.M. Tuesday, November 20, 2018. Family and friends may gather at the church one hour prior to the service at church. She will be laid to rest alongside her husband Donald at the St. Boniface Catholic Cemetery in Chetek. The family would like to invite their guests and family to join them for luncheon and fellowship following the interment at St. Boniface Cemetery. You will be missed Barb, mom and grandmother, we love you. The Rockow family has entrusted the Burnham-Ours-Kolstad Family Funeral Home of Chetek with arrangements.